Update July 3, 2017: Blizzard are now showing off Stukov’s skins, sprays, and all that jazz, so you can plan exactly how you want to kit him out when you get your hands on him. You can check out all the cosmetics above. If you’re more interested in what’s going on in the mechanics of the game, though, hang around. Blizzard have also released the PTR patch notes. What is the best MOBA? Click that link and ye shall see. Obviously, Stukov himself takers centre stage in the notes, but there are plenty of other changes besides the infested Terran. Xul has been buffed, there’s new art and animation updates, and there’s also some changes to maps. Check it all out on Battle.net. Update June 30, 2017:Stukov has been revealed in a Heroes of the Storm spotlight video. You can even watch it above, because we’re nice like that. Being an infested Terran, this support character’s healing powers will spread among his allies. When not healing his pals, he’s launching gross pustules at his enemies. Extend Stukov’s arm. If it hits an enemy Hero, they are rapidly shoved until they collide with terrain, taking 200 damage. Stukov gains 50 Armor while shoving an enemy. [Passive]Spine Launcher:Basic Attacks become ranged and Slow enemies by 20% for 1 second, but deal 50% less damage. [W] Fetid Touch – Quest: Hit Heroes with Weighted Pustule. Reward: After hitting 20 Heroes, reduce the cooldown of Weighted Pustule by 2.5 seconds. Reward 2: After hitting 40 Heroes, reduce the cooldown of Weighted Pustule by an additional 2.5 seconds and remove its Mana cost. [E] Growing Infestation: Lurking Arm’s area expands by 50% over 2.5 seconds. [Trait] Poppin’ Pustules – Quest: Detonate 10 Weighted Pustules without dying. Reward: Detonating a Weighted Pustule now applies its damage and Slow in an area. After a Healing Pathogen infests 4 targets, restore 30 Mana and reduce the cooldown of Healing Pathogen by 2 seconds. [Q] Top Off: Healing Pathogen’s healing-over-time on its initial target is increased by 50% while they are above 60% Health. [Q] Biotic Armor: Healing Pathogen grants 50 Physical Armor to its initial target while active on them. [Trait] Vigorous Reuptake – Quest: Detonate 50 Healing Pathogens with Bio-Kill Switch. Reward: Increase Bio-Kill Switch’s healing by 50%. Increase the range of Weighted Pustule by 100%. [E] Within My Reach: Increase the range of Lurking Arm by 50%. [E] It Hungers: Each time an enemy Hero is hit by Lurking Arm, reduce its cooldown by 0.5 seconds, up to 6.5 seconds, and restore 5 Mana. [Trait] Targeted Excision: Detonating exactly 1 Weighted Pustule (but any number of Healing Pathogens) with Bio-Kill Switch reduces the cooldown of Bio-Kill Switch to 5 seconds. [Active] Flailing Swipe: Swipe 3 times in front of Stukov over 1.75 seconds, dealing 50 damage to enemies hit and knocking them away. Each swipe is larger than the previous. [E] Low Blow: Lurking Arm deals 150% more damage to enemy Heroes below 25% Health. [E] Lingering Spines: Lurking Arm persists for 1.5 seconds after it is canceled. [E] Virulent Reaction: Detonating a Weighted Pustule on an enemy who is inside of Lurking Arm Roots them for 2 seconds. Bio-Kill Switch no longer removes Healing Pathogen and instead refreshes its duration. Healing Pathogen can continually spread through Stukov, but its healing is reduced by 60%. [Trait] Eye Infection: Increase the final damage of Weighted Pustule by 50%. Additionally, detonating a Weighted Pustule with Bio-Kill Switch Blinds the target for 3 seconds. [Q] Superstrain: Whenever an ally with Healing Pathogen is Stunned, they are instantly healed for 250 Health. Flailing Swipe’s Mana cost is reduced from 100 to 50 and it gains 2 additional charges, but each use only swings 1 time, at maximum range. [R2] Push Comes To Shove: Massive Shove travels 25% faster. If Massive Shove pushes a target for more than 1.5 seconds, its cooldown is reduced by 15 seconds. [Trait] Bio-Explosion Switch: Bio-Kill Switch now also detonates Lurking Arm, applying a Weighted Pustule to enemy Heroes inside and Silencing them for 2 seconds. Update June 29, 2017:It’s official – Stukov is infesting HotS in an upcoming update. The Hero hasn’t been fully revealed yet, with his moveset and whatnot, but Blizzard have released a new tease. Gameplay will be unveiled during tomorrow’s first HGC matches, so you can get a proper look at him in action then. We’ll update when he’s been shown. Original Story June 28, 2017: The official Heroes of the Storm Twitter account just started teasing a new announcement for Blizzard’s MOBA. As is usually the case with these things, it’s likely a new character. Since HotS is so fond of cameos from other Blizzard games, we’re betting it’s another – this time from StarCraft. Look at the first reply to that – it’s only the StarCraft account with some cheeky emoji. Our best guess? 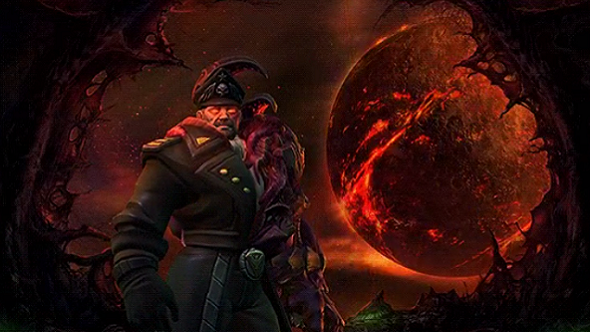 Stukov, an infested Terran character from Heart of the Swarm. We’ll update when we’re proven right.